It is common problem in most of the mini projects that how to convert DC voltage into AC voltage. When we develop any circuit that gives dc output voltage and if we want to convert it into AC voltage, this DC to AC converter is used. In this project, we will see how to control 120V AC supply using 12V DC output. Variable resistor (potentiometer) of 50K? Above circuit can be used for a range of +5V to +15V DC voltage. This DC voltage is applied to the NE555 timer IC. NE555 produces frequency proportional to the input voltage. At the output terminal, we have used two transistors. One is NPN and other is PNP. These two transistors are used for driving transformer coil. An inductor of 1µH is used in series with the 2200µF capacitor. You can also get output voltage between 120V to 230V AC at 50-60Hz. The output voltage depends on the step up transformer used in the circuit. You can also use a similar transistor instead of TIP41 and TIP42. You can use this as your second or third year engineering project. This is a simple mini project using IC555. It is easy to build and all components used in the circuit are easily available. 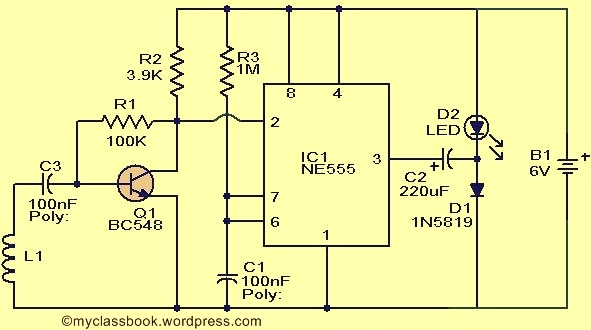 Hi friends, in this series of mini projects today we are going to make one simple mini project of police siren alarm using IC 555 (timer IC). This mini project generates a sound like police siren using astable multivibrator circuit of NE555 timer IC. You can make this project as your first or second year engineering mini project. This is one of the simple but useful mini projects and all components used in the circuit are easily available. As discussed earlier this circuit uses two NE555 timer ICs which are connected as an astable multivibrator. This circuit can be operated on the 12V dc power supply (you can also use 9V battery). To generate a siren sound we have used a speaker having specification as 64 ohms and 560 mW. In this circuit, IC1 is used as slow astable multivibrator which works at 20Hz and having duty cycle as 50%. IC2 is fast astable multivibrator and having high frequency than IC1 nearly equal to 600Hz. These frequencies of IC1 and IC2 depend on values of resistors and capacitors used in the circuit. Because of two different frequencies of IC555 and output of first is connected to the second it produces sound like a police siren. See also: Rain detector with alarm – mini project. Hello friends, are you searching for one good mini project for your submissions? If your answer is yes, then your search will end here. 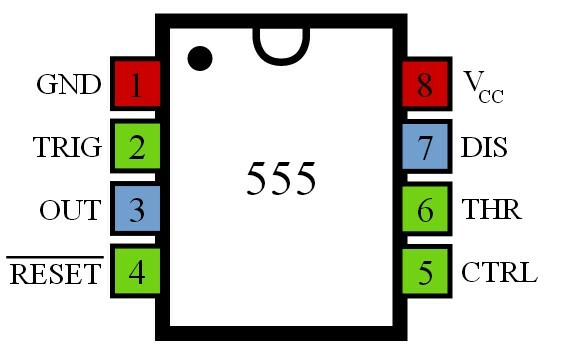 Today I am going to make a circuit that will indicate an incoming or outgoing call or message from your mobile phone. Yes, you can do such awesome mini project with some simple electrical components within no time. Let us start making our “Mobile incoming call indicator” mini project. In this mini project, we are going to make a simple circuit that will detect a mobile phone. In this mini project, we have used a LED which will glow instantaneously when a mobile phone rings. Whenever your mobile phone receive an incoming call, it will activate a transistor in the circuit. The coil L1 acts as an antenna which will sense the oscillations. These oscillations then are given to the base of transistor Q1 thus activating the transistor. As the output of transistor i.e. collector is connected to the IC 555 which get triggered and glows the LED connected to its output pin. Thus when LED glows we can conclude that there is an incoming call surrounding the circuit. In this mini project, we have used a 6 Volt DC power supply. Build a circuit on a PCB (See: How to make PCB layout in Eagle software). C1 & C3 are to be polyester capacitors. Today we are going to make a project which will detect the preset water level and when water is reached to this level it will generate a sound. The objective of Water Level Alarm Circuit is to generate a sound with the help of buzzer when a water level in a tank reached to its preset level (Predefined mark). Here is the simple water level alarm circuit using 555 timer IC which will produce an audible sound when the water level reaches to its preset level. This circuit uses 3V DC power supply. Therefore this circuit is quite handy to use. 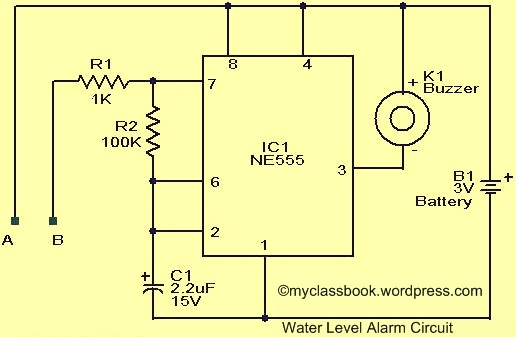 This circuit of water level alarm is based on the astable multivibrator which is wired around IC1 (NE555). The operating frequency of this astable multivibrator depends upon the values of capacitor C1, resistors R1 and R2 and the resistance across probes at A and B. when there is no water up to the level of probes, because of open circuit astable multivibrator will not produce any oscillations hence the circuit will not produce sound. When the water reaches the level of probes, the circuit will be completed and some current flows through the water. Thus astable multivibrator produces oscillations proportional to the values of C, R1, R2 and the resistance across the probes. Now the buzzer will beep to indicate that the water is reached to its preset level. Probes can be made of two insulated copper or aluminum wires. Preset level means the level that you want to detect the water in the tank. Place the probes to a preset level, so that it will close the path and generates sound using the buzzer.